http://www.heraldbulletin.com wrote: The 2-year-old Dutch shepherd used for drug detection and suspect tracking and apprehension was off duty only a few days when Madison County Sheriff Scott C. Mellinger made Ellis an offer he couldn’t refuse. “They have a K-9 vehicle that’s not being used right now,” said Alexandria Police Chief Matt Ellis. After taking a couple of days to sign a memorandum of understanding between the law enforcement agencies and obtaining insurance, the Alexandria Police Department was able to take possession of the loaner squad car. Riggs was taken off duty on May 1 because the K-9 squad car used to contain and transport him no longer is safe for use. http://www.readingchronicle.co.uk wrote: A convicted criminal leapt out of a crown court dock and ran, after a judge told him he was going to jail today. http://www.norwichbulletin.com wrote: According to police, Biekert did not consent to a search of the truck. 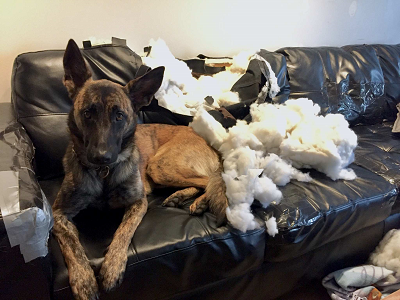 Police said a cross-trained narcotic Dutch Shepherd police dog was used, which alerted them to the odor of narcotics coming from the car and its front seat. Thanks for posting these. Do you search "Dutch Shepherd in the news" to find them?